Porter and Jack are obsessed with balloons. So, Tom blew up a latex glove (because we don't have balloons lying around) and Porter thought it was the coolest thing ever. He then started giving it "high fives". He now calls it his "High Five Balloon." He goes around giving it high fives and asking anyone around to do the same....weirdo. and baby boy makes three. So, the news is in. We're having another boy! Although I am extremely excited for this new little bundle of joy to grace us with his presence, I am a tiny bit sad, and have to admit that I shed a few tears that we will not be having a girl in the family. As many of you know Tom and I have firmly decided that we can only physically, emotionally, and financially handle three kids...so we will be a family of three boys! 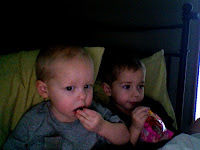 In other news, we're going to an Open House at the Preschool tonight where I would like to send the boys. I have to go and stand in line for an hour to get a number for a chance to get in, but I'm going to do it anyway. Porter will go there for two mornings a week and Jack will go there for one morning a week. Big things today in the Thor house! Today we decided to go to the Mitchell Park Conservatory for a Lego Train Exhibit. "The Domes" are a conservatory and have an Arid Dome, a Tropical Dome and a Floral Show Dome that doubles as a rotating exhibit. Right now it has a train exhibit with lots of flowers and plants surrounding a train track and a pond. It was pretty neat and we are glad that we just happened upon it. Lots of the activities we do around town are things that we just happen upon. But the story actually lies before we left. Porter was having a hard time getting ready, he doesn't really want to do things on his own right now, but we're trying to get him to be more independent. So, he was crying and I was getting frustrated and so we calmed down together - he's really good at counting to ten and taking deep breaths. After he calmed down, he grabbed his blanket and said, "Mom, me wiping my blues away with my blankie." Where he learned that, I don't know...but he got a big hug after he said it! What happens when you're gone. I wonder why Jack refuses to nap longer than 1 1/2 hours. Especially yesterday, when we're stuck inside due to 1) weather and 2)Tom took the van, along with the keys to the Subaru with him to work (by accident). So, not only is it -9 outside, I am also stuck inside trying to get a few projects done and Jack seems to think he only has to sleep for a mere 1 1/2 hours! I painted the main floor bathroom yesterday. It was this very dark red wine color - nice color but it made the bathroom feel very small - so I painted it the same khaki color as the kitchen. When Porter woke up from his nap he said, "Me smell something. You painted. And he walked right into the bathroom and said, "This looks so nice mommy! Good job!" How cute. Tom came home from work at 9:45 pm and said, "What did you do? Something smells." I am pretty sure he wouldn't notice anything different for a few days except that he does not like the smell of paint. When Tom works late for several days at a time or goes on a work trip he tends to come home to something that has been changed. Either a room as been painted, furniture moved around or there is something new in the house. You would think he would enjoy that since then he doesn't have to do it, but he always warns me before he leaves to not touch anything. I guess my nesting instinct is setting in already. A few months ago we were at the pet store and Porter was looking at the kittens. I told him that we couldn't have one because I was allergic to cats. After a couple seconds he said, "When you dead I can have one." And so I said, "When I'm dead and gone, you can have whatever you want." Whenever he sees a cat now, he says, "When you dead mommy, I can have a kitty." Today we were sitting on the couch watching their two morning shows and Jack was climbing all over us. Porter said, "You drivin' me crazy Jack." Those are some pictures I took of Porter one day while he was being silly. Look at those eyelashes! To die for! We're getting cabin fever here and have had about enough of the cold and snow. I think the boys are getting a little antsy to get outside but they can only stand in the freezing wind and snow for so long, then their eyelashes start freezing together and their noses burn. Oh to be in Mexico on a sandy beach right now!!! Yesterday Tom was having trouble with the Subaru again and so the boys and I had to load up in the car last night and go and get him from work. Although I wasn't upset about having to go and get him, I hate cars. I hate everything about them. I even hate when the gas light pings! Needless to say, I was not happy about the Subaru. And, in my fragile pregnant state I've been known to swear like a sailor. So I was sitting on the couch thinking about getting in the car and I said quietly to myself, "F***in' Subaru". Then when I was putting Porter into his car seat he said, "F***in' Subaru". Oops. I sure wasn't expecting that one! I will now make sure that I refrain from using expletives while Porter is in the room. On Saturday we were getting ready to trek - when I say trek - I mean drive 45 minutes away - to go and stock up on things at Costco. Before we left, Porter was going to the bathroom and Jack was pretending to help him. I went to get my shoes on and came back and found Jack loading bath toys into the toilet.... Then he said, "Guck, Bafff!!!" Which of course everyone would understand as, "Duck Bath." How can you be mad??? Today there was a fly in the spare bedroom where we were building a fort and playing in the tent. I asked Porter to get it and he somehow caught it - I think it was already mostly dead - and held it in his hand, without even a hesitation that it might be a gross bug. We have less than two weeks until we find out what the baby is - any suggestions on how to find out???? With Porter and Jack we had the tech write down the gender on a card and put it in a sealed envelope. We took that to Gap and picked out two going home outfits - one boy, one girl and asked them to wrap up the one that matched the card - we left while they did that so we were surprised - and then opened the box at dinner. It was fun! We haven't really decided what to do this time. Can't wait to find out though!